Clinton River is one of the most beautiful sights that can be seen on the world famous tourist route Milford Track. It is in the southwestern part of the South Island of New Zealand, Clinton River is mandatory stop for anyone who takes on the famous path to the fjord Milford Sound. 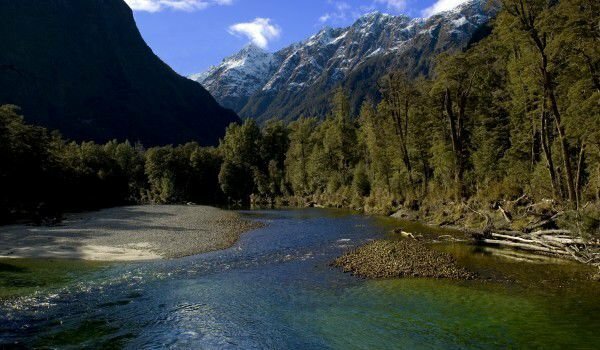 Clinton River flows entirely within Fiordland National Park, which is the largest in New Zealand and one of the largest in the world. Feeding from the second largest freshwater lake in the country, Lake Te Anau, Clinton offers many beautiful views. Milford Sound follows the river from the lake up to its west branch. In the western part of Clinton, you can reach the nice and diminutive Lake Mintaro. Among fishermen, this part of New Zealand has long been popular as an excellent place to catch trout with record sizes. In addition to Te Anau, passionate fishermen throw lines in the river Clinton, Glaisnock and Worsley River. Some aficionados even hire a fishing boat to reach untouched parts of the river in the desire to capture a giant trophy. In the Clinton River you can catch almost any kind of trout. Fishing is not a free pleasure. Access to the river for a whole day cost about 600 New Zealand dollars, and for half a day, it is 350. The picturesque River Clinton is surrounded by scenic greenery - grasses, trees and fallen logs. In places, the river resembles a swamp with its greenish water. It is not uncommon to see small trees, which pop up directly from the bed of Clinton. The panorama offers picturesque hills, cut by some waterfalls.